In a milestone night for Toronto band Birds of Bellwoods, it seems the only blemish was misnaming the bartender bringing them a crowd-bought round of beers. Other than that, the four-man folk ensemble was on point, delivering hillside ballads and furious banjo boleros with uniform passion. Aligned in a tidy row at the front the stage, the group etched themselves a little piece of local lore one harmony at a time. The fiery Stephen Joffe, gripping the '50s doo-wop microphone to his face, led the show off with the intense elocution and slow build up of "Roll Your Stone." Simmering at the precipice of boiling over, Joffe's gritty candour set the tone for rest of the evening. Joffe clawing a sunburst mandolin, Kintaro Akiyama poised with double bass, Chris Blades shredding banjo and Adrian Morningstar salaciously strumming — each performed their required vocal duties with precision, accenting with hums, shouts and harmonies. A genuine quartet, the group explored doo-wop territory and traditional rounds with ease. The set list was juxtaposed by combustible floor stompers and sweet love songs, all thoughtfully pulsed by muted guitar strums, bass lines and foot tambourine from Blades (who also completed the multi-instrument trifecta by busting out a trumpet during "Cannibals"). Not that they had any problem keeping rhythm considering the audience's healthy assistance of claps and foot falls. The varied material, which included a cover of Radiohead's "Idioteque," displayed the band's range, but their knack for crafting love songs stood out above all else. Tracks such as "No Less Than All" and the longing "Train Song" fell on eager ears, but the romance of the swaying encore "Better Than Me" triggered slow dancing and amorous embraces. 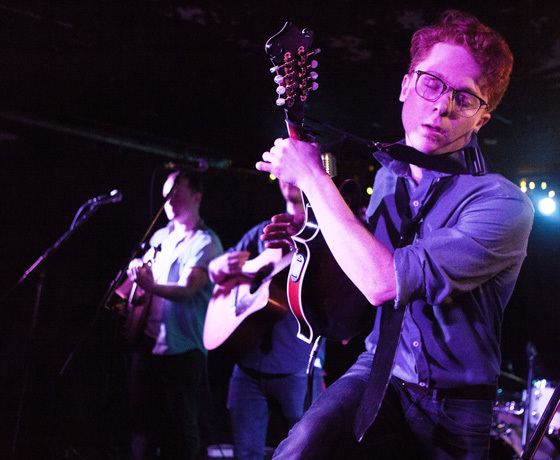 A hearty combination of traditional melodies and song structure has found a happy coupling in the urban folk of Birds of Bellwoods. This recipe of enthusiasm and talent will make them a solid attraction for roots and folk fans (and music fans in general) for the foreseeable future.